An elegant pair of sterling silver and glittering diamond set earrings. Shimmering cultured freshwater pearl adds a feminine finishing touch. 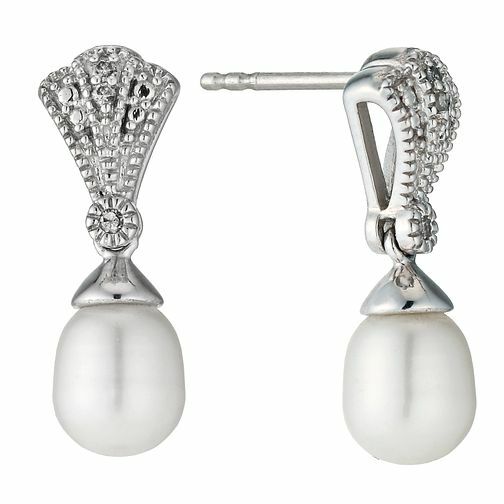 Sterling Silver Diamond Freshwater Pearl Fan Drop Earrings is rated 5.0 out of 5 by 4. Rated 5 out of 5 by Anonymous from Really nice earrings Bought these for my mum to go with a pearl watch set we got her and she absolutely loves them! Quite small but that sort of adds to the charm of them looking almost like an antique, whilst the diamonds sparkle enough to make them look modern. Very elegant for a little bit of sparkle for a special occasion. Rated 5 out of 5 by Anonymous from Beautiful dropped earrings Beautiful dropped earings, very elegant for my wedding day.